The ‘Common Entrance Examination for Design’ (CEED, 2019) conducted by Indian Institute of Technology Bombay (IIT, Bombay) every year to offer admission to the candidates aspiring to pursue ‘M. Des’. 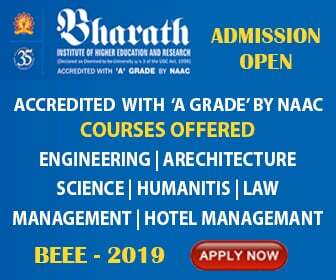 All the aspirants can apply for the entrance exam and admission who want to have a Master’s Degree in Designing (M. Des) from different prominent institutions like IITs, IISc. The candidates are offered admission in M.Des and PhD on the basis of their performance in CEED 2019. The admission in Master of Design (M.Des.) through CEED is offered at IISc Bangalore, IIT Bombay, IIT Delhi, IIT Guwahati, IIT Hyderabad, IIT Kanpur, IIITDM Jabalpur. For Ph.D., the candidates can apply at IISc Bangalore, IIT Bombay, IIT Guwahati, IIT Hyderabad, and IIT Kanpur. For M Des and PhD Programs CEED 2019 will be conducted by IIT Bombay on 19th January 2019 (Saturday) from 10.00 to 13.00 hours. The online registration starts from 09th October 2018, and last until 16th November 2018. Candidates must have completed a degree / diploma / post graduate degree program of minimum 3 years (after 10+2 level)or must be appearing for the final examination of such a program by July 2019 or must have passed the GD Arts diploma program (10+5 level) by July 2018. Before applying for CEED, candidates are advised to check whether they meet the required eligibility criteria for admission to various institutes. CEED 2019 will be conducted on Saturday, 19th January 2019 from 10:00 - 13:00 hours. The examination will consist of two parts, Part A and Part B. Candidates must attempt questions from both the parts. Part A will be conducted from 10:00 to 11:00 hours followed by Part B from 11:00 to 13:00 hours. Every effort will be made to complete the examination in this session. Part B answer books will be evaluated manually for the candidates who are shortlisted fromPart A. In Part B, there will be 8 questions of total 100 marks. Of these, questions 1-5 are discipline specific, that will have 40 marks each and the candidates have a choice to attempt any one of these questions. CEED 2019 Examination will be conducted in the following cities:Ahmedabad, Bengaluru, Bhopal, Bhubaneswar, Chandigarh, Chennai, Dehradun, Delhi,Ernakulam, Guwahati, Hyderabad, Jaipur, Kolkata, Kozhikode, Lucknow, Mumbai, Nagpur,Panaji, Patna, Pune, Raipur, Thiruvananthapuram, Thrissur and Vishakhapatnam. ceed syllabus - Check the syllabus online on the official website.